Like Windows 7, Windows 8 also shows important messages in system tray displayed by Action Center. Windows checks for problems in background and sends you a message when there is any problem related to Security or Maintenance features, including Windows Error Reporting, Windows Defender, and User Account Control. To seek user attention, the Action Center pops-up a notification in the taskbar and suggests fix for listed issues. 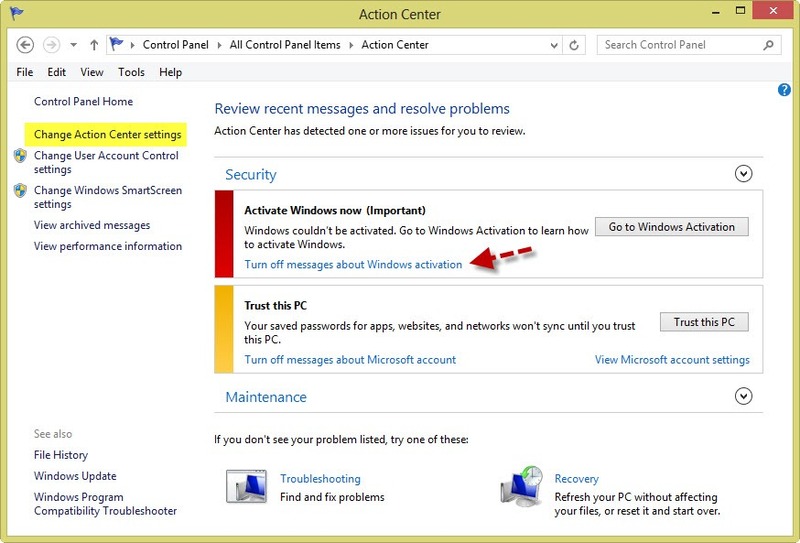 Perhaps, if your Windows is not activated then you’ll be reminded to ‘Activate Windows now’ at frequent intervals. This can turn annoying if you’re using a 90-day trial version of Windows 8 or rearm trick for extended trial. To turn off or disable the ‘Activate Windows now’ message, go to Action Center (Win + X > Control Panel). 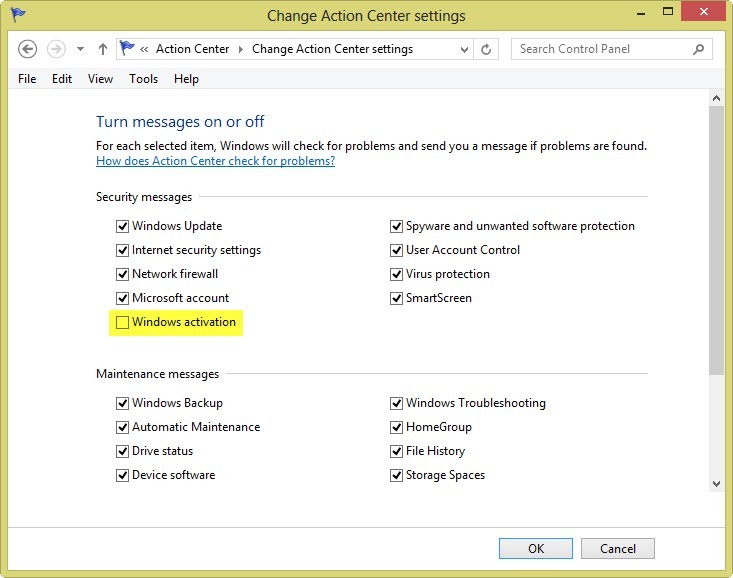 Under Security, simply click the option ‘Turn off messages about Windows Activation’. Alternatively, you can open ‘Change Action Center settings’ from left-side pane and uncheck the Windows activation option. There you can turn messages on or off for various other services as well. Tip: To disable Action center messages on taskbar, open Control Panel > Notification Area Icons. Change the behaviour of ‘Action Center’ to ‘Hide icon and notifications’. Click Ok and then you won’t be notified about changes or updates. Well thanks a lot, this windows 8 activation notification has been bugging me every day. Was looking for this so long ago, easy solution, I’m a dump, Thank you so much! this is super awesome, it worked fine for me…God bless you bless you mehn. Actually, this wasnt the Solution, Im talking about the Blue Pop Up!! Plz Tell Me how to Stop It!!! This wasn’t a solution. That’s how its done in Windows 7. Windows 8 is the Blue Pop up that always pops up, and the option to unselect Windows Activation is greyed out! So i tried to change the action center settings and it won’t let me uncheck the check? any suggestions? I am logged in with admin rights. thanks for the post – but that particular option is greyed out in my copy and i cant seem to be able to check or uncheck that option. Cab you help me please. . . .
same here blue pop up several times /day , so annoying and can t uncheck the windows activation option . Useless manual. Checkbox is greyed and i can\’t uncheck it. So how do i do uncheck that box? Yup, like others on Windows 8.1, the activation checkbox is greyed out. Even using software like Winabler won\’t let me uncheck it. Whenever I unlock my computer, there is an app that comes up in a blue background that has a single button \’activate windows\’ i think. I press ok and it gets me to the desktop (thanks Start8) and then there is a window on the upper left hand corner every time that lets me know how to get the Metro screen by moving my house to any corner of the screen (which I have disabled with Start8). I want to stop these messages, maybe Stardock can take care of it.At least the latter which doesn\’t have to do with activation. I found this works. Its for Windows 10 but I am running Windows 8.1 and using method 2 worked.